And it only took us another 50 years or so before it became commonplace. LIKE pictures on a screen, the best of public-address amplification and loudspeaker reproduction hitherto available has lacked reality. It is not that the instruments are defective in their reproduction of pitch and volume; but the ear is a fairly selective instrument, and hard to deceive when aided by the eyes. The sounds are right, but the directions from which they come are wrong. However, a recent demonstration, staged by telephone engineers, has the astonishing effect of overpowering the testimony of the eyes. Unseen players, singers and dancers seem to move tunefully or noisily across an empty stage. Not only is the quality of the reproduction high, but each of the multiple speakers used is giving out a different interpretation of the sounds picked up. The result is that the ear, receiving varied sounds from different directions, finds in them a “stereophonic” or “solid-sound” characteristic; just as the eye judges the distances of shapes moving before it. 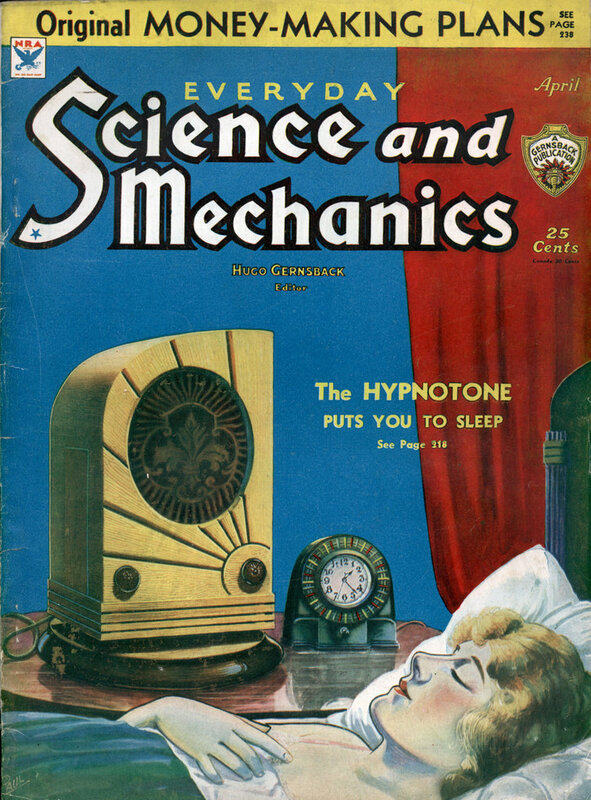 For years, the idea of binaural or “two-eared” reproduction has been toyed with. Two microphones, located some distance apart, were connected through amplifiers to two loud speakers, one on each side of the audience. Mysterious effects were thus produced, and in many cases amusing, when the positions of the speakers did not correspond to those of the microphones. 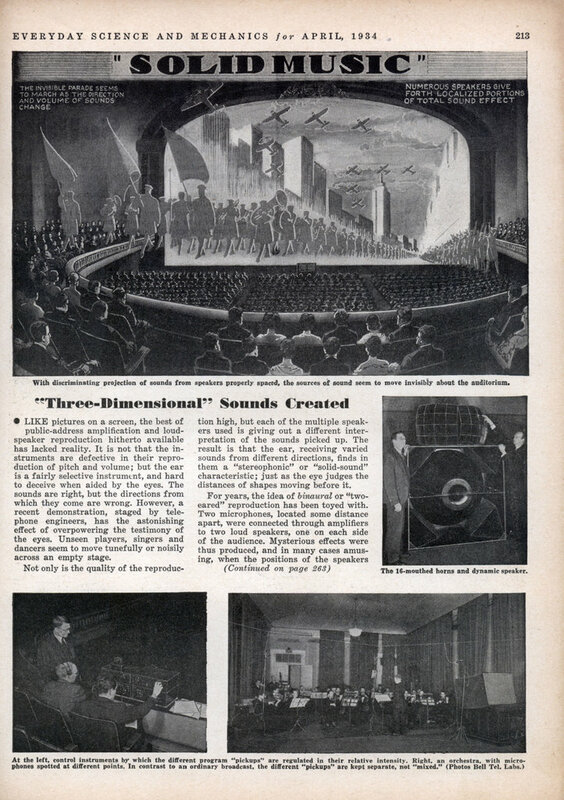 But the newest system of “three-dimensional sound” goes further. Several microphones, and several amplifiers, with loud speakers of new design and unusual fidelity, are combined to give unusual effects. For instance, an orchestra is located in a hall on one floor; the loud speakers in an auditorium on another floor. The orchestra seems to the listeners to be present before them; the different instruments to be placed in their proper position. A dancer crosses the floor above; the tap of his shoes is heard crossing the empty stage below in ghostly fashion. It is possible to imitate the passage of a band, as illustrated in our picture. And the acoustic engineers can not only give a faithful reproduction of an orchestra but, with their filters, tone and volume controls, execute variations on it at will. For instance, the voice of a soloist can be amplified independently of an accompanying orchestra, and lifted above it. Electrically, we can have a thousand-piece orchestra. The artistic possibilities of “auditory perspective” are as yet only experimental, but they place a remarkable opportunity before composers and conductorsâ€” greater, perhaps, than any of the technical improvements in musical instruments of the past.